The Place I was researching for cheap and affordable Michelin Star restaurants in Osaka for my recent trip and Takama is one of those which came under my radar. As a restaurant which specialises in soba, I am surprised that the One-Michelin starred Takama restaurant only opens during lunch hours. The restaurant is easily accessible via the subway Tenjimbashisuji 6-chome Station, where you can head towards exit 6 and walk for about 600m. Takama is located along a small road. The space is really cosy and feels homely. The seating capacity is about 14 persons, denominated by a long communal table and another small table for 4 persons by the side. The Food The menu is relatively concise as the family run restaurant only serves two types of soba using buckwheat flor from Fukui prefecture – Mori soba and Inaka soba. The former is a regular-style soba made from marunuki flour, and the latter is made with hikigurumi flour. For a side dish to share, I recommend the Dashimaki (850 yen), Japanese style rolled omelet with soy sauce and hot radish. There is something about Japanese omelet which is so delicious, especially when there is dashi involved. For the soba, I tried the Tenzaru Soba (2,200 Yen), which comes with cold soba noodles in dipping sauce and an assortment of tempura. This is extremely vague for money as there is a good mix of tempura dishes, each fries to a nice crisp texture without the usual greasiness. There are two tempura prawns, and five to six tempura seasonal vegetables along with wasabi and welsh onions. The Ebiten Oroshi Soba (2,200 Yen) is similar to the Tenzaru Soba, except that grated hot Japanese radish is served instead. The soba has a very clean taste and while I wouldn’t say it is mind blowing, it was very enjoyable to have it with the sauce. If you enjoy a warm soup to go along with the cold soba noodles, go for the Kamoshiru Soba (1,600 Yen) which comes with warm duck soup. The duck soup itself is already quite flavourful, but once you add the soba water to it at the end of your meal, the flavours changed completely and it is even more aromatic. The last part of enjoying the soba comes with a pot of soba water, where we get to pour it into the soba sauce and enjoy it as a drink! I was initially sceptical about it but the taste turned to be very delicious. Rants The small space means that there is usually a queue to get in. It is also a pity that Takama is only opened during lunch hours. Will I Return Again? For the affordable Michelin experience, I wouldn’t mind returning just for good soba. 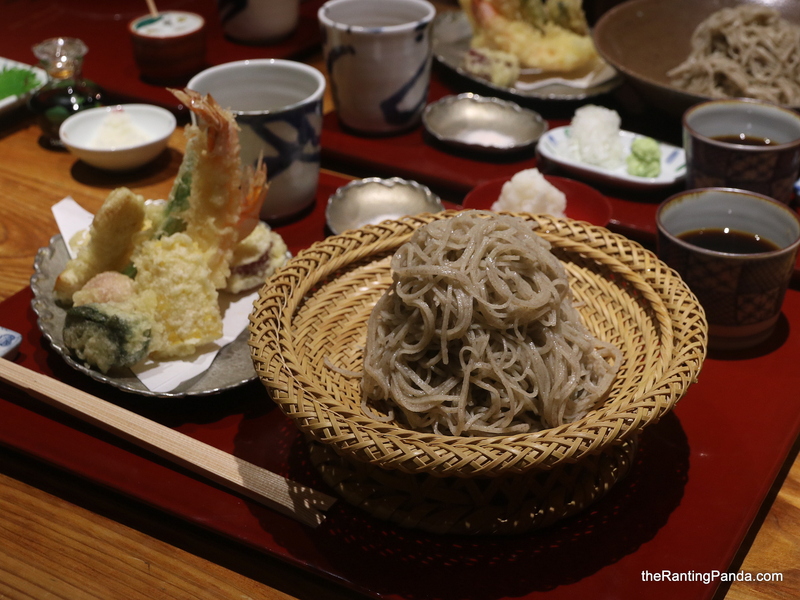 Takama is perfect if you are a soba lover. We love to share nice restaurants!